Last night my friend Mark Zagrodney and his teenaged daughter Emily came over for dinner and an operating session. I met Mark many years ago through the Layout Design SIG and he’s one of the most well-informed people I’ve ever met when it comes to operations, so it’s always a treat to have him over to run a train. Mark headed for the van as conductor, while Emily took on the role of engineer. I perched out of the way and played host, tour guide and historian, with only the occasional need to step in and solve a problem: We had one derailment (a caboose that gave me trouble before, so it’s going to come off the layout for a closer inspection) and one spot where the rails needed a quick touch from my graphite stick. The layout is working better now that we’re out of the stupidly hot and humid weather we had earlier this month. I’ve had many friends come for a visit to run trains, but this is the first time I’ve had a father-daughter team and it was really interesting to watch two people who know each other so well work together. They were like old hands on a job on a real railroad – one that they’ve done for years together. Granted, the layout is still relatively new to Mark – and it was Emily’s first visit – but they weren’t also trying to learn how to work with their fellow crew, so they could focus on the task at hand. I know Mark will come back – and I hope Emily does too. She’s an excellent operator. She watched her speed and she made sure she knew where she was going before she started moving the locomotive, so she committed no operator errors. That’s something very few experienced layout operators can say about a session on an unfamiliar layout. (Well done, Emily!) Those of us who think we know everything about running model trains should take the time to teach an interested teenager. Chances are, we’ll learn as much as our student. The newly-installed fast clock system worked well – I set the session’s start time for 11:00, and the session wrapped up at 15:28, so there was a real sense (for me, at least) that time had passed. And as Mark noted in the comments on my slide-out work desks, having a place to organize his thoughts about the work at hand helped him achieve “a relaxed and deliberate state of mind”. I’ve noticed that too, already, in my own solo sessions, so I’m really glad I built them. I’m looking forward to the next visit from Mark and Emily! For dinner, we enjoyed delicious burgers with potato salad and coleslaw. I can call them “delicious” without sounding like I’m praising my own cooking because I didn’t have time to make burgers from scratch – and in any case, the patties from Rowe Farms are very hard to beat. My wife and I did make the salads, based on a couple of favourites we’ve picked up from Cook’s Illustrated. A bottle of vino verde was a delightfully refreshing pairing for a summer evening. While we often go out for dinner these days, I used to cook a lot more when hosting work nights or operating sessions and I need to get back to doing that. For one thing, dinner was timed perfectly – Mark and Emily had just pulled Extra 80 West into Port Rowan, checked for waybills, and written up their switch list, when we all decided we were hungry. 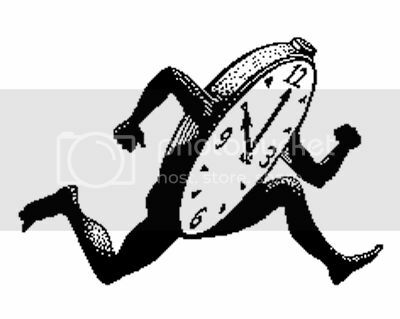 The time on the fast clock was about 13:00 if I recall correctly, and I know from reading about the prototype line that the crews would take a break in Port Rowan for lunch – and even a nap, if time permitted. 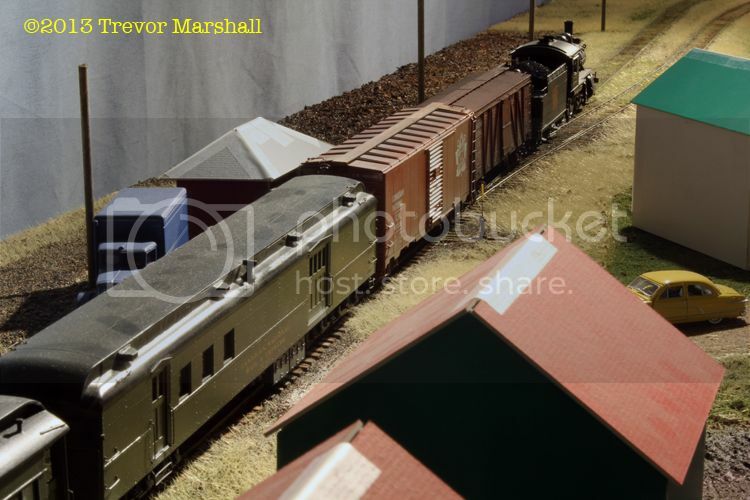 Talk about a relaxed way to run a railway – and a stress-free way to operate a layout! Fast clock system buyers may specify six speed ratios for their clock controller – from 1:1 up to 20:1. I opted for 2:1, 4:1, 6:1, 8:1, 10:1 and 12:1 (although if I was ordering a system today I’d probably scrap the 10:1 and add 3:1 instead). I am testing the 4:1 ratio for layout operations, so a minute of layout time passes every 15 seconds of real time. So far, it’s proven to be the right one – requiring 4 to 5 hours of scale time to run a session. The 12:1 ratio is very handy for confirming that the clock system is working correctly, and for fast forwarding the clocks to a set time if you’re only running a partial day. On my layout, I’ll reset the clock as appropriate when I’m distributing waybills and LCL freight receipts as part of my pre-operations set-up. I am very, very pleased with GML’s fast clock system. I tested it extensively on my previous layout and it’s been very reliable. The system is also easy to wire: I ran two wires from a 9-volt “wall wart” transformer to the controller, and then daisy-chained my two clocks with another pair of wires. I used 22 gauge, two-conductor, heavily-insulated speaker wire for all connections. Even though my current layout is based on a one-train-per-day branch line, the clocks add an important element to operations: Time. Railways are governed by time. 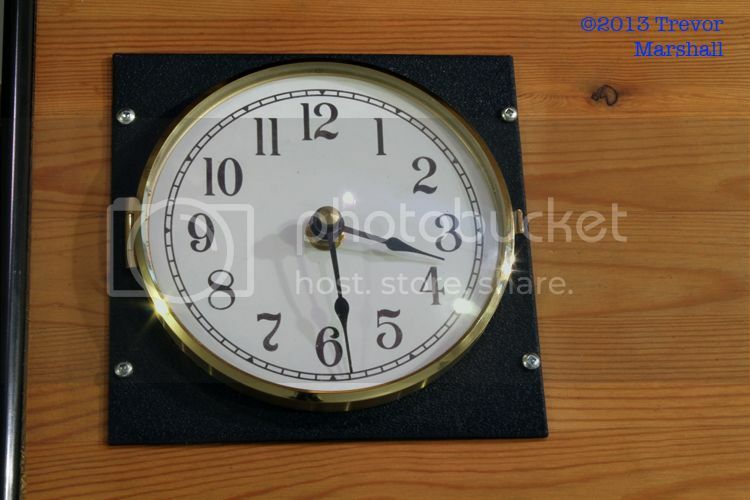 A clock is an integral part of modelling them realistically. The clocks will be particularly important for correct operation of the mixed train. I will use them not only to govern movements according to the time table, but also to determine the length of station stop required based on the amount of LCL to be unloaded. Plus, it’s really nice to run a session and realize four scale hours have passed: It contributes, greatly, to the feeling that real work has been accomplished! Every layout designed for realistic operating sessions needs to provide conductors with a place to work. 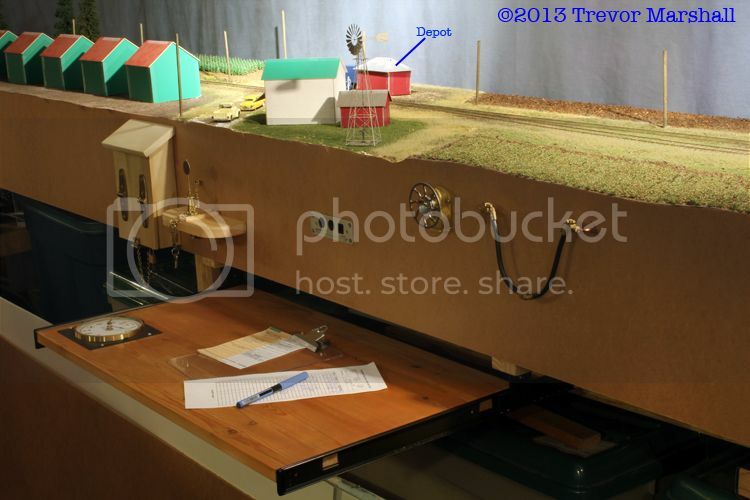 On Plywood Pacifics, this is often the layout surface, but that’s a really bad idea once scenery is in place. 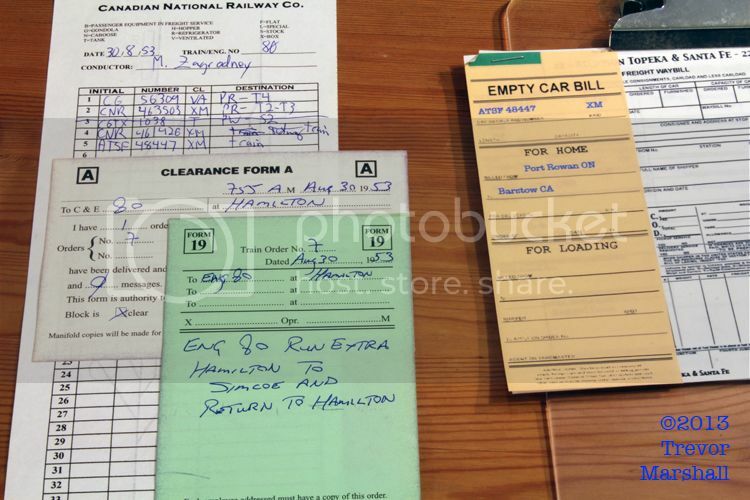 I realized that there’s a lot of material to juggle during a session – including prototype waybills, switch lists and LCL receipts… not to mention, an uncoupling tool and a throttle. 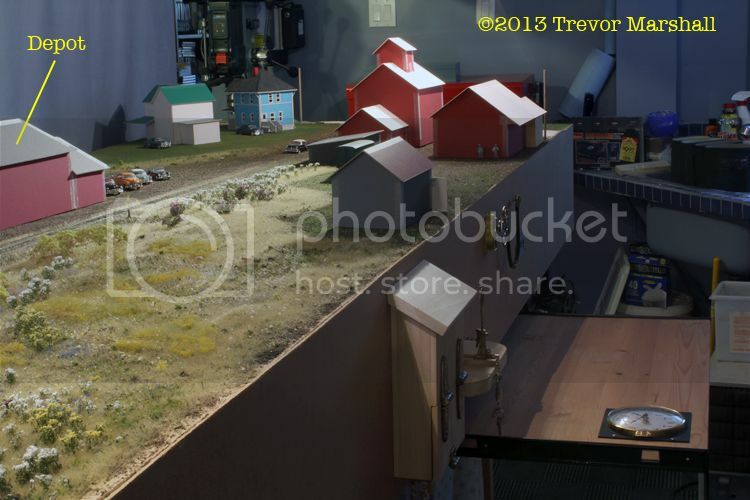 I found that I was putting things on a stool that’s tucked under the layout when working St. Williams, and using the top of a chest freezer as a desk when working in Port Rowan. Surely, I thought, I can do better: A nice, solid surface that one can use to spread out papers and organize one’s work. But, I also wanted to keep such surfaces out of the aisles when not in use. So yesterday, I built a pair of slide-away work desks – inspired by the slide-away keyboard shelves found at many computer workstations. Here’s the desk for St. Williams, in the closed and open positions. I like these because they come in different lengths, they’re modestly priced, and they have stops to hold the shelf in the closed position so it’s not going to roll out by itself when not in use. This is particularly important at Port Rowan, which is in a narrower aisle. 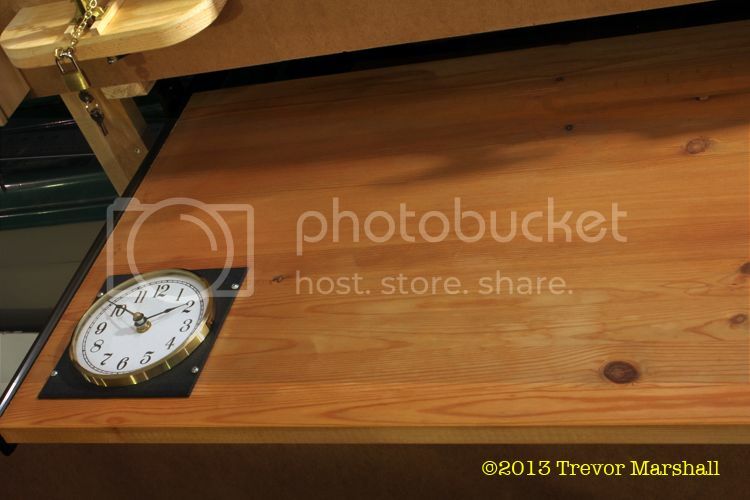 Not everybody will be able to use the full depth of the desk – it depends on each operator’s, um, “diameter”. While working out how to handle the LCL traffic at St. Williams, it occurred to me that it’s probably time to focus more on this area of the layout. 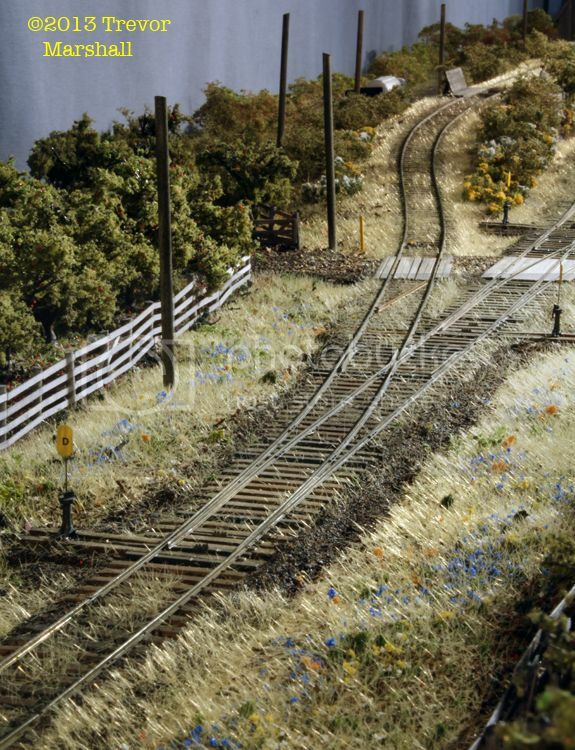 I’ve done an overall first pass of scenery on the layout, but the Port Rowan area has received a lot more attention in this regard, with the addition of second-wave elements such as weeds and bushes. 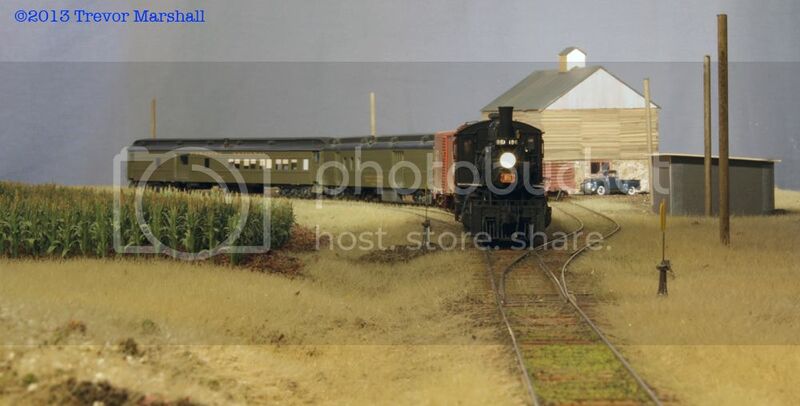 Port Rowan has also benefitted from the addition of a few finished structures such as the coal dump, the section house, and the team track barn. St. Williams has crops, but no fences. There are no trees, no weeds, and no bushes. The team track area has one finished structure – the grain storage building I’ve relocated from Cheltenham – but the station area is still 100% mocked up. No promises on when I’ll get this done. But stay tuned. The train has just arrived. The combine is stopped just clear of Charlotteville Street, lined up in front of the station, so several things can happen. First, passengers can get off or on. Second, express can be loaded/unloaded. 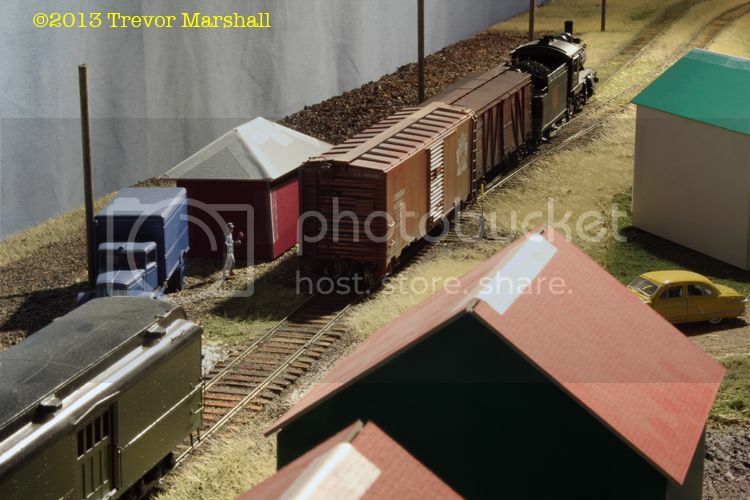 And third, the conductor can check with the station agent to see if any freight switching has to be done here. So far, so good. The problem – at least, on my layout – is that the platform for the St. Williams station stop will end about where that first line pole is. Basically, across from the RPO section of the Baggage-Mail car. 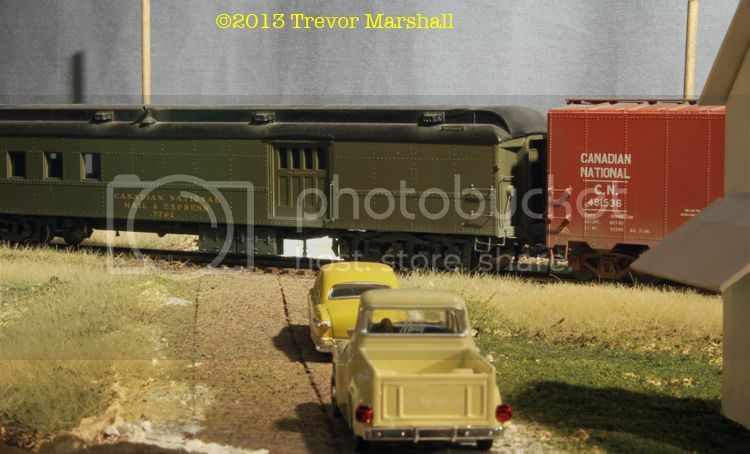 So, how will the agent and crew work the LCL boxcar? Once the LCL work is done, the crew would have to retrieve its passenger equipment and conduct a brake test before leaving town. Real railroads sometimes (often?) did this – so that when the crew lined the switch for the siding the derail cleared automatically, and when they lined it for the main again, the derail set itself. 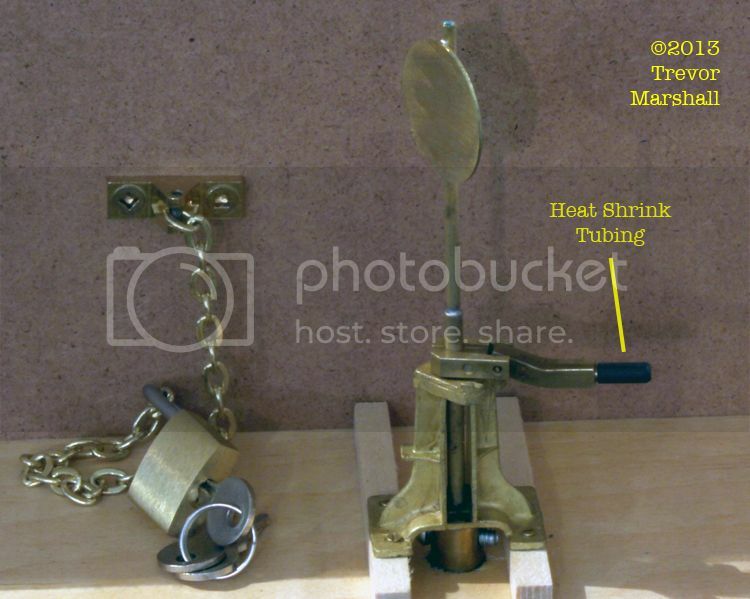 This was accomplished through mechanical means – rodding and bell cranks, like at an interlocking plant. 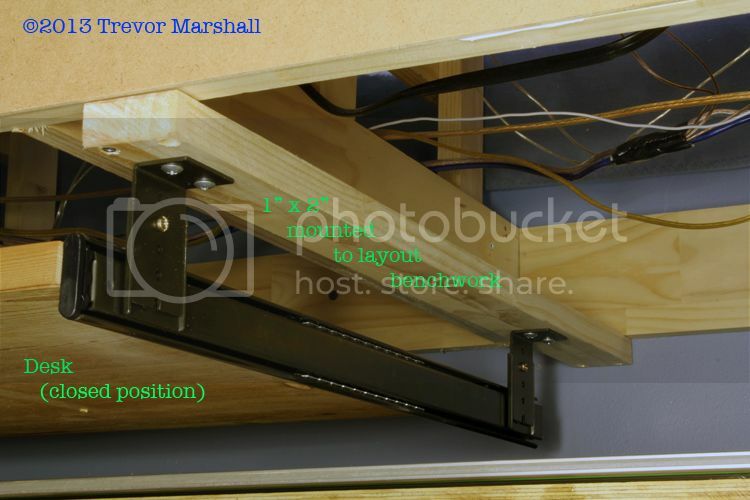 The easiest way to do this on a layout would be to use stall motor switch machines – for example, Tortoises – to control the switch points and the derail. Then, simply wire them to the same controller – push buttons, toggle switch, DCC accessory controller, etc. From the perspective of the layout operators, the derail would become invisible. 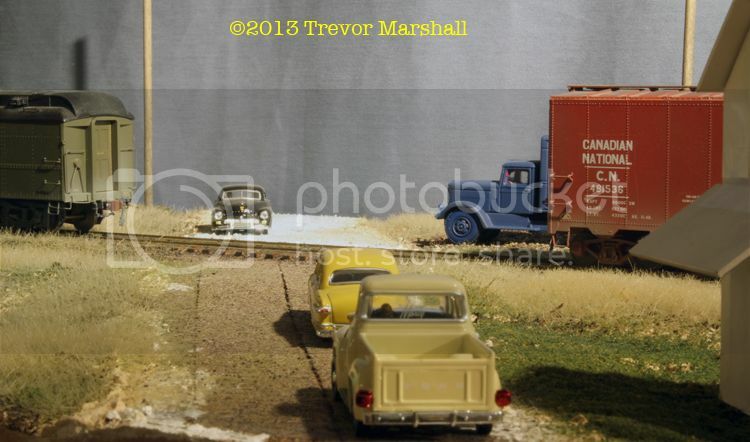 On my layout, switching the Coal Track would be no different than switching the Team Track. This is why I did not even consider interlocking the derail to the switch. By having it independently controlled, train crews must perform two steps to work the Coal Track: unlock and line the switch, then unlock and clear the derail. Whether one builds a working derail, and how it’s controlled, depends in large part on what one wants to accomplish during operations. At the micro level that I’m working, on this modest layout, it makes sense to introduce elements like the derail – providing they contribute, in some way, to the experience of working a short freight or mixed train on a branch line. Reader Steve Lucas sent me some interesting information to help me detail my recently-installed derail on the coal track in Port Rowan. (Thanks, Steve!) Here’s a look at what I’ve done. 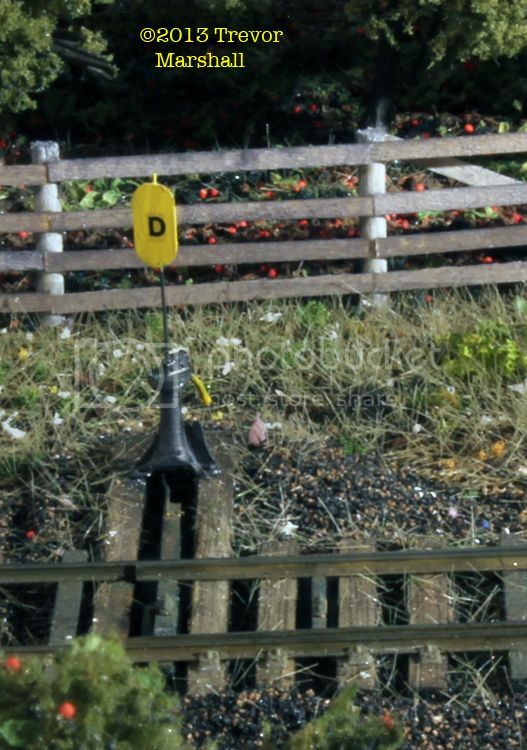 In a comment on a previous post, Steve noted that in the 1950s, the CNR would add a “D” to the target on the switch stand if it lead to a track that had an independently-controlled derail (i.e. : one that was not linked mechanically to the switch stand). They would also add yellow paint to the switch stand handle to remind the crew that there was a derail to unlock and clear. I found a “D” in an old set of HO Scale Herald King decals for a CP Rail gondola. The “D” actually came from the decal set identifier, which now reads “GON OLA”. Thanks, Herald King! We’ll see if it feels different enough to remind people that there’s something special about the coal track siding. If not, I’ll cut this off and try something else – perhaps, a couple of narrow bands of heat shrink instead of a solid length of it. First, at left, is a length of rail spiked to the ties at an angle. Some CNR info from Steve notes that if a derail is placed close to the clearance point of the spur, or at the base of a steep downgrade, a guardrail must be installed to help divert successfully-derailed equipment away from the main track that the derail protects. 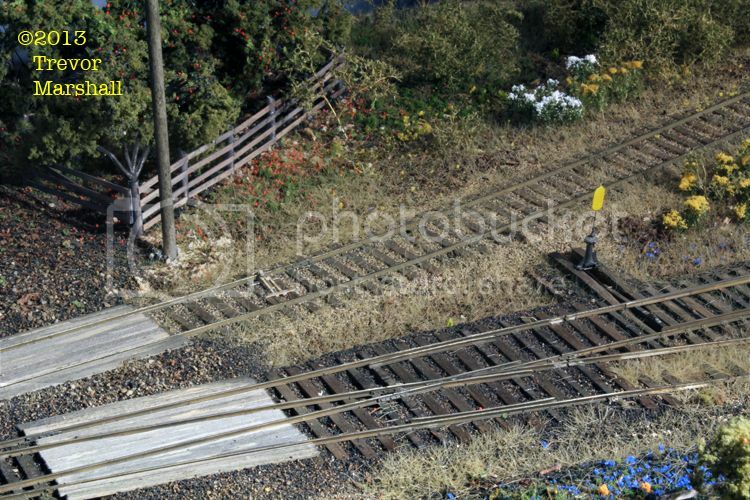 I assume in this case that the farm crossing will get torn up rather nicely by derailed equipment, but that the equipment will eventually hit that guard rail and stay off the main track. In any case, it’s a very visible detail. I bent and filed the ends of the rail in the same manner that one does a traditional guard rail for a turnout frog and then glued and spiked it in place. I’ve given the rail a first coat of paint and will weather it after the paint dries. To the right of the crossing, a yellow post marks the location of the derail itself. I cut a five-foot piece of S scale 4″x4″ lumber and shaped the top into a four-sided point using an emery board. 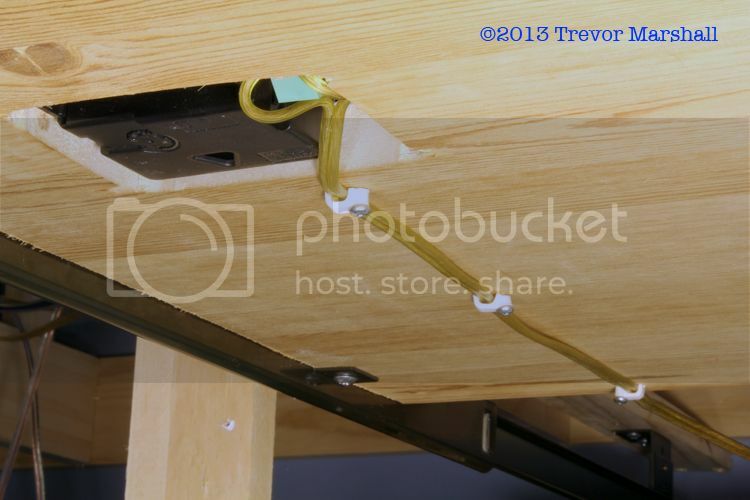 I drilled a hole in the base for a .015″ piece of wire, and a hole in the scenery to mount it. 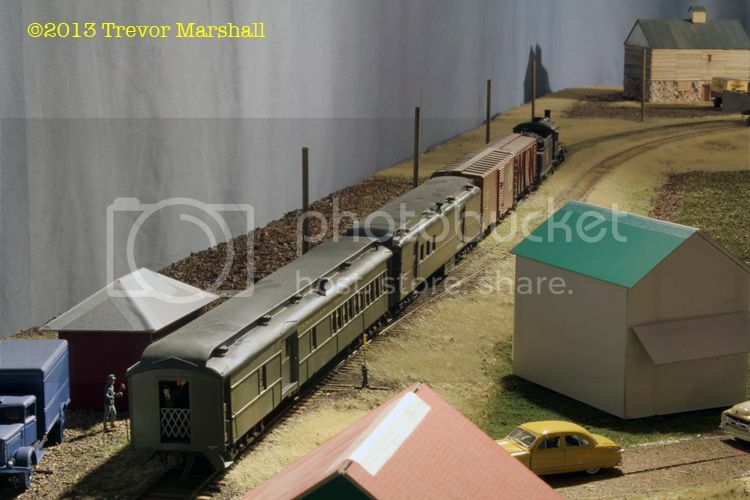 The photo also shows that I’ve painted the derail. I gave the block a coat of yellow, but the rest of it is painted with Neo-Lube. I didn’t want to use regular paint here, since that could gum up the sliding piece. As the name suggests, Neo-Lube actually lubricates the operating mechanism. I’m pleased with these little details. All that’s left to do is mount a control on the fascia and connect it to the mechanical switch machine under the derail. Until I get that done, I’ll leave this detail in the “clear” position: I don’t want to put any cars on the ties by accident! … for the summertime blues. Except, perhaps, dehumidifiers. Whether it was the minor flooding earlier this month, last week’s super-hot weather, a combination of the two, or some other factor – the layout is not running well. In addition, one of my moguls obviously has a dirty sound cam so that sometimes it sounds like it’s beating out a military tattoo. Instead of a “chuff-chuff-chuff-chuff”, I get a “chuff-chuffity-ch-chuff-chuffity-chuff”. You get the idea. I suspect a spike in humidity in the layout room is to blame. I have a vintage dehumidifier but it’s time to go looking for a new one – hopefully quieter! 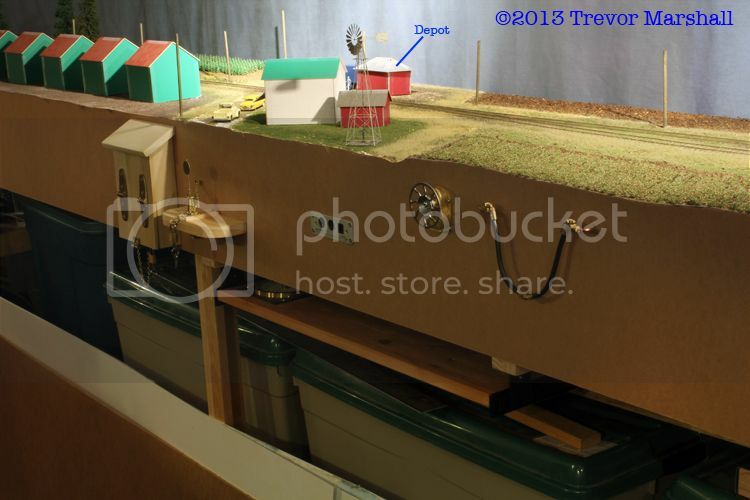 I scratch-built the derail yesterday – here’s the story. 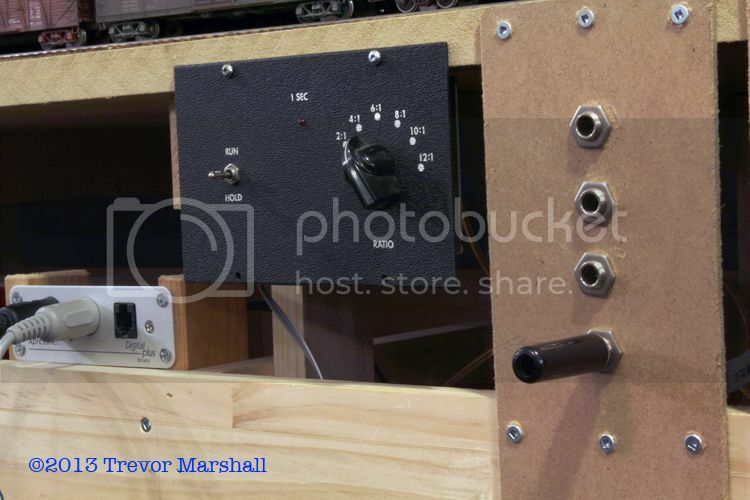 I’ve also mounted a Bullfrog mechanical switch machine under the derail and tested it. The derail slides smoothly in both directions. I’ll “paint” the derail with Neo-Lube, which looks like oily steel and will help keep the derail sliding smoothly. The head will be painted yellow. I still have to install a yellow post trackside to mark the derail. And my friend Chris Abbott is working on a control mechanism similar to the garden-scale switch stands we’ve used to control track switches. Stay tuned! A few people have mentioned the flip-over style derail. I thought about doing one of these but could not think of a suitable mechanism to make it work. Bell cranks would not, I feel, do the trick: They don’t have the rotation that such a derail would require – it could be as much as 170 degrees. The derail head would be soldered to a small – very small – brass pulley. Maybe something from the model shipbuilding hobby would do the trick. 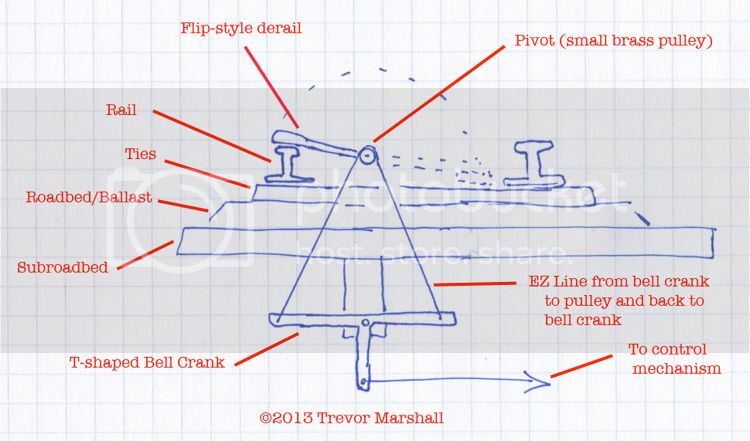 Below decks, a T-shaped mechanism – like two bell cranks back to back – would move a piece of EZ Line over the pulley. EZ Line is elastic and would provide good grip on the pulley – but it would also stretch when the derail head reached the end of its travel, so it would add some flexibility to the throw mechanism. I haven’t tried this – and I’m not going to – but if you do then let me know how it works out!